The domestic ferret is very susceptible to canine distemper. In the domestic ferret, this disease is considered 100 percent fatal. The disease can be spread by direct contact with infected animals and by indirect contact. They can be carried the error or brought in on your clothes, and the skin. Fortunately canine distemper is easily provided through annual vaccination wasn't approved vaccine. Make sure that your vet understands that a vaccine made with ferret tissue cannot be used. This may cause the disease in the ferret. Presently, only the vaccine Fervac is approved by the USDA for use on the domestic ferret. Taxation of the ferret against canine distemper will save the ferret from the disease. Most pet store ferrets will have received the initial vaccination for the breeder. A booster is required by 11 weeks of age and another at about 12 to 14 weeks of age. There is a general agreement that the ferret can be revaccinated every year after that. People bringing ferrets to some ferret shows may be required to show proof vaccination against canine distemper within the last six months. For its own protection, the ferret should be an isolated against rabies by licensed veterinarian. The only current USDA approved vaccine is are IMRAB-3 and PRORAB-1, both "killed" virus vaccines. These should be the only vaccines used since they are the only ones recognized by the government. The vaccination is recommended at 14 weeks of age and annually thereafter. Ask the veterinarian for certificate of vaccination and carry it with you whenever you are outside of your home with your ferret. The canine distemper and rabies axial should not be administered in the same day. A two-week period between these vaccinations is recommended. Otherwise, allergy reaction to vaccines may occur. Such a reaction is life-threatening. Always remain at the veterinarian's office for at least 30 minutes or longer after the vaccination make sure that your ferret does not develop such a reaction, which is characterized, but not always, by diarrhea, retching and/or volatile, possibly followed by rapid drop in body temperature, shock and even death. 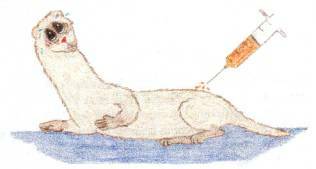 Use of live virus vaccines risky giving the ferret rabies and will not be recognized should a bite occur. In that case, the ferret will be sacrificed for analysis of the brain tissue. Many authorities today in recognized the IMRAB or PRORAB vaccine and may still demand surrender of the animal. With the approved vaccines, you and your pet have a chance that the person who was better might be willing to forget the incident. If a bite is reported to public health authorities, they may demand that you surrender your animal to be killed untested, regardless of vaccination and regardless as to whether it has ever been anywhere where it could have even been exposed to the rabies virus. Remember that no one has any authority to seize your ferret without a court order, nor can they kill your animal without a hearing if you demand one. Rabies in the domestic ferret is quite rare in fact since 1956 only 16 cases have been reported in the entire United States. Some cases are believed due to the use of liver vaccine is naturally gave the ferret the disease. There has never banned a case reported in the U.S. are the ferret transmitting rabies to human. Taxation of the ferret against rabies is primarily to save the ferret from humans and is therefore very important.